Just been experimenting with the new telescope and the camera. 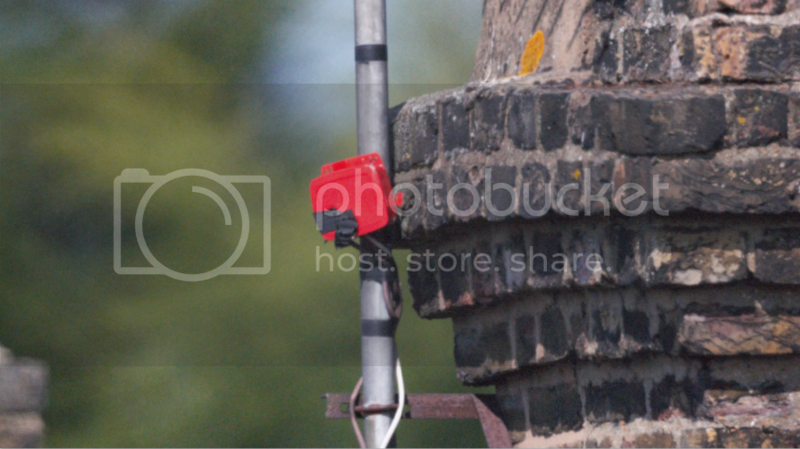 This is a shot of an ariel cable junction box on a chimney on a house 200m down the street. The camera is a Sony A300 DSLR and I was never able to get it to focus on the Dobsonium but it seems much more at home on the SCT. At first the camera was on the A setting and it wouldn't take a picture because there was no lens on the camera. It was ok on the M setting using a remote trigger. I hope the skies stay clear. Can't wait to point it at Saturn tonight! Have fun with your imaging. Dobsonians sometimes have eyepiece holders that are too long to allow standard cameras to focus the image. The image sensor in the camera can't get near enough. Getting a shorter eyepiece holder can sometimes help. Using a webcam or other camera not designed to be used with a lens can often work. I've not heard of any problems with an SCT, so you should be safe. With the camera directly in the end of the telescope I was able to find a focus straight away. But with the barlow lens between the telescope and the camera I wasn't able to focus at all. So it sounds like a similar problem. So I'm probably not going to be able to record a bigger image of Saturn until I get myself a web cam! If you referring to the SCT, then a normal barlow won't move the focussing out of range. Are you getting an out-of-focus image, or no image at all? A barlow will reduce the field of view making it harder to find. It also reduces the amount of light falling on the sensor. You could try focussing on an easy target like the moon first, and then go on the the planet. Try increasing the exposure, and/or the ISO figures. OK, cheers for that. I probably need to sort the alignment first. I wasn't getting an image at all. I thought my finder red spot was set up accurately but perhaps not! Unfortunately, prime focus with a DSLR doesn't usually give the best results on planets. I've even tried it with an effective 9 metres focal length! I've used a 2x and 3x Barlow together. Even the ancient (much-maligned) art of afocal projection is often better. I have a webcam but the driver keeps crashing my PC! I've found you can get a 2nd hand PS3 Eye camera from CeX for 50p. Gfamily2 wrote: I've found you can get a 2nd hand PS3 Eye camera from CeX for 50p. I used an Xbox cam for a while. One problem with most webcams is that they do not work on all versions of Windows.